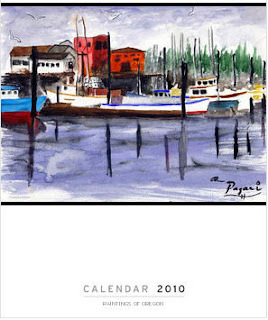 "Paintings Of Oregon" 2010 calendar - it is a unique gift idea; rare, unlikely to be duplicated. It may seem early but now is the time to preorder before it's too late. This is a collection of my paintings in a nice art print size. Once each month is done, you can save and frame each print. You won't find a better bargain in fine art anywhere. You'll love these watercolors and pastel paintings of the natural beauty of Oregon. I guarantee it. And so will your friends. Thank you, in advance, for choosing my art.. I'm reading: Paintings of Oregon 2010 CalendarTweet this!